Fulham opened a parish workhouse in 1732 at the east side of the High Street, then known as Bear Street. It was managed by a master under the supervision of the churchwarden, overseers, and a board of trustees. From 1743, an annually appointed workhouse committee had overall responsibility for the institution. Prior to 1754, when silk winding was introduced, the inmates were occupied in picking oakum. A new workhouse, a substantial brick building, was erected in 1774, also at the east side of Fulham High Street though it is not clear if it occupied the site of the previous establishmnet. The inmates had meat for dinner on four days a week, and bread and cheese on other days. There was milk-porridge for breakfast on five days, and bread and cheese on the other two, with the children receiving bread and butter. In 1777, the establishment housed up to ninety inmates. From 1790, the inmates were occupied in carding and spinning. In 1802, Dr Henry Bunnett, who acted as the workhouse surgeon, apothecary and midwife, offered to provide the parish's paupers with innoculation against smallpox. In 1819, the committee was replaced by a 'select vestry' which continued in operation until 1837. 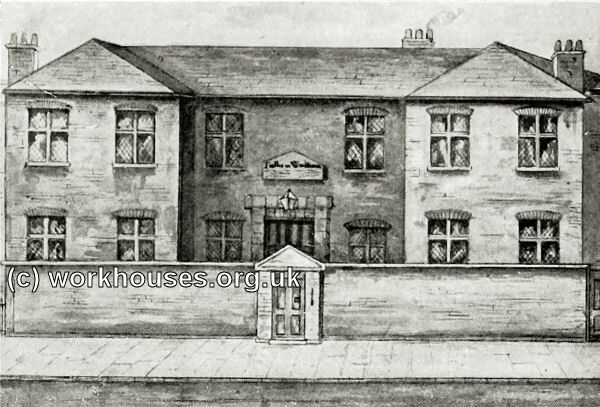 Fulham workhouse, drawn from memory by Mr C. Wilcox in 1897. On 11th February, 1837, the parish of Fulham became part of the new Kensington Poor Law Union. Following this, paupers from Fulham were housed in a number of establishments: males in a workhouse at Kensington, women at Chelsea, boys at Hammersmith, and girls in the former Fulham parish workhouse. In 1845, The Kensington Poor Law Union was dissolved and Fulham united with Hammersmith parish to form the Fulham Poor Law Union. This arrangement continued until 26th March, 1899, when the Fulham and Hammersmith were constituted as separate Poor Law parishes. 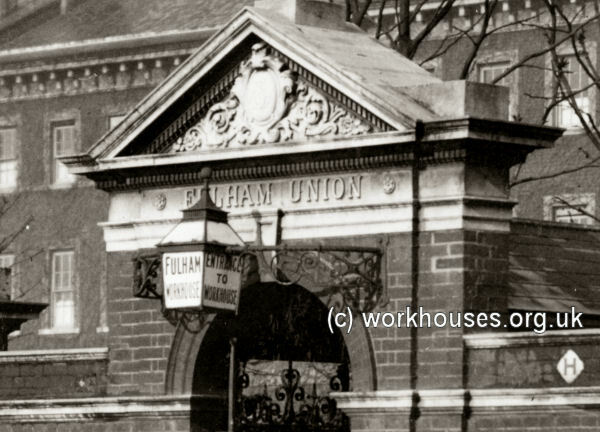 In 1848-9, a new Fulham workhouse, for up to 450 inmates, was erected at east side of Fulham Palace Road. It was designed by Alfred Gilbert and adopted a corridor-plan layout with entrance block, T-shaped main block and infirmary running in parallel. Fulham workhouse from the north-west, 1849. WORKHOUSE FOR THE UNITED PARISHES OF FULHAM AND HAMMERSMITH. THE first stone of this new workhouse for the Fulham Union was laid by the Right Rev. the Lord Bishop of London, on, Monday, in the presence of the members of the present Board of Guardians of the Union, and those of the past year, and the leading and other inhabitants of both, parishes, to the number of about 800 persons, a large portion of whom were ladies. The site is a plot of ground, five acres in extent, on the side of the high road leading from Hammersmith Church to Fulham, and close to where stood Brandenburgh House, once the residence of Caroline, Queen Consort of George IV. 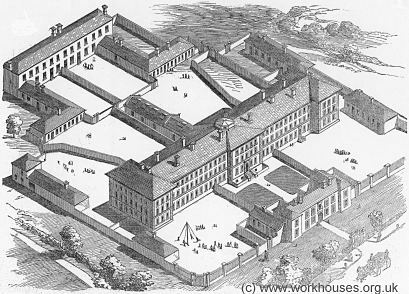 The Workhouse, the infirmary and receiving-houses of which are already erected, is to contain 450 inmates. The style of the building is Italian, of red brick, with stone door and window dressings. The plan includes spacious yards for each class of inmates, and play-grounds for boys and girls ; besides a chapel. The main building, which is 150 feet from the road, is approached through an archway, over which is the Board Room ; and on either side is accommodation for relieving officers, porters, &c. Mr. Alfred Gilbert, architect, has furnished the design ; and Mr. John Glenn, of Islington, is the builder. At the foundation ceremony, on Monday, the Bishop of London, on his arrival, was received by the chairman, architect, &c., and a procession composed of the children of the union,' the parish authorities, clergy, &c. being formed, his Lordship at once proceeded to lay the stone. During the ceremony, the children sang a hymn composed for the occasion; and, at the close, the National Anthem was sung, and heartily joined in by the Bishop and the numerous company assembled. At five o'clock, the guardians, past and present, with the principal inhabitants of both parishes, to the number of nearly 70, dined together at the Albion Hall, Hammersmith, to celebrate the event; John Gunter, Esq., of Fulham, in the chair. The convivialities of the evening were kept up to a late hour. In 1884, a pavilion-plan infirmary was erected at the north of the workhouse site facing onto St Dunstan's road. 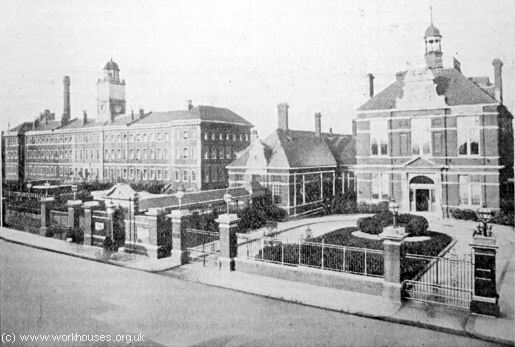 A nurses' home known as Brandeburgh House stood opposite the infirmary at the west side of the Fulham Palace Road. A casual ward for vagrants was located at the east of the site on Margravine Road. The workhouse location and layout are shown on the 1916 map below. Fulham workhouse and Guardians' Offices (right) from the south, c.1905. 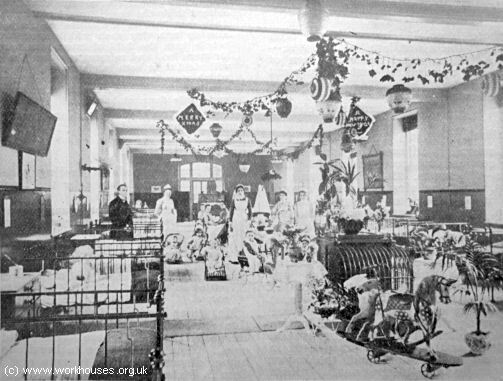 Fulham workhouse infirmary children's ward, c.1905. 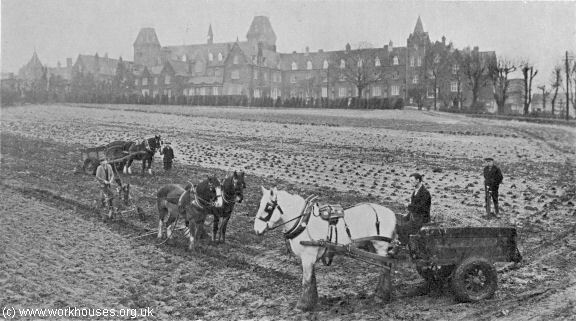 From 1915 to 1918, the workhouse and infirmary were taken over for use as Fulham Military Hospital. 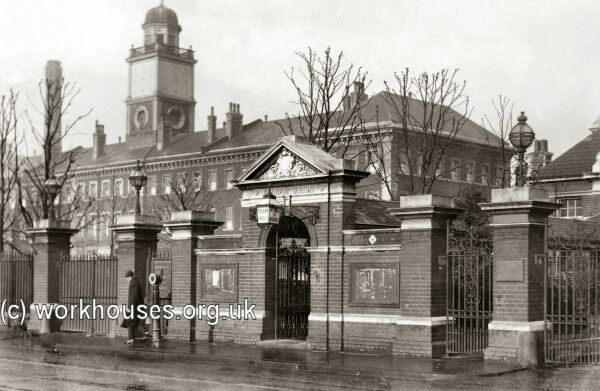 Fulham workhouse / military hospital from the south c.1915. 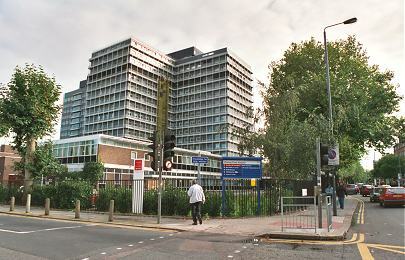 The site later became Fulham Hospital and is now the Charing Cross Hospital. All the former workhouse buildings have been demolished. Fulham former workhouse site from the north-west, 2001. In 1908, Fulham took over the former South Metropolitan District School at Sutton, which became known as the Belmont workhouse. Eighty-six arrests were made as the result of a serious outbreak which occurred at Belmont overflow Workhouse, near Sutton, Surrey. The inmates refused the porridge for supper and commenced to throw the crockery, knives, and forks at the labour masters. Unable to cope with the disturbance, in which 350 men were engaged, the staff telephoned for police assistance, and a force of 40 constables and two inspectors arrived on the scene. Inspector Sommerville, on entering the hall, was struck the chest with an iron plate. The general body of police then made their way into the dining hall, where one the inmates shouted, "Come on, boys, up with your plates!" Pelted with crockery, knives, and forks, the police were obliged to draw their truncheons, and, after a brief fight, obtained the mastery. Eighty-six prisoners were conveyed to Sutton in cabs, and were subsequently accommodated for the night at Carshalton, Banstead, and Sutton Police Stations. The 86 inmates arrested were yesterday brought up at Sutton, charged with being concerned in refusing to conform to the regulation of the Workhouse, and with doing wilful damage to the extent of £2 10s. One of the men, named Jeffrey, was further charged with assaulting Labour Master Swan, and another, named O'Brien, with assaulting Labour Master Rylance. Mr. Higgins, the Workhouse Master, stated that about 350 men refused eat the food provided, and made a great disturbance. Later, they refused to retire to rest, and when the officials entered the room they were pelted with plates. The police went to the officials' assistance, and the hall was cleared. A quantity of crockery was damaged. Answering the Bench, witness said the men objected to so much porridge. Labour Master Rylance corroborated, and said O'Brien assaulted him. O'Brien: You and the Master have committed perjury. Labour Master Swan stated that one of his teeth was knocked out by Jeffrey. Mr. William Alexander White, a member of Board of Guardians, who was present the disturbance, said one man urged the others to demand bread and butter. They had previously warned the police, because the men had knives, and it had been said there would bloodshed before Christmas. Police-Inspector Sommersgill stated that some of the men had knives, and assumed a threatening attitude. The police had to draw their truncheons, and when reinforcements arrived 86 were arrested. Both Jeffrey and O'Brian were committed for trial. Of the remainder of the prisoners, five were discharged, and others were each sentenced to three months' hard labour. Belmont rioters on their way to prison, 1910. In 1916-19, the Belmont buildings served as a military hospital. 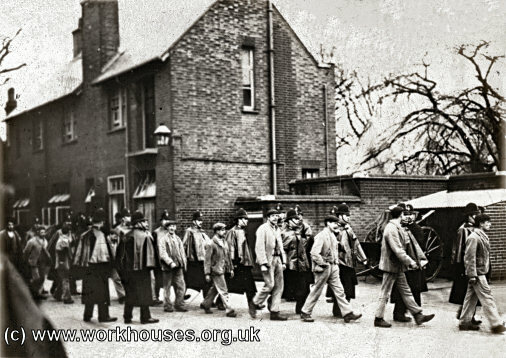 During the 1920s, the establishment began to introduce a programme training for inmates to improve their employability. This was further developed by the London County Council who took over the establishment in 1930 and renamed it the Sutton Training Centre. 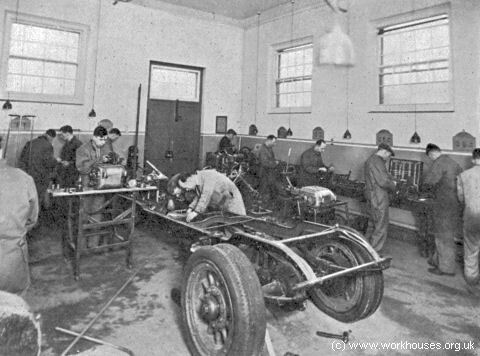 The subjects of instruction grew to include bricklaying, plastering, painting, carpentry, tailoring, boot-repairing, motor repair work and driving, ticket and poster writing, wireless assembling and testing, and hairdressing. About thirty acres of land were cultivated or used for livestock, with around forty trainees occupied in pig-keeping, poultry farming, and fruit, flower, and vegetable growing. Belmont inmates doing farm work, 1930s. Belmont inmates doing motor repair work, 1930s. The site later became Belmont Hospital, renamed the Henderson Hospital in 1958. The buildings have now been completely demolished and a housing estate occupies the site. By the early 1900s, the Fulham Union had established a receiving home for 80 children at Henniker House, 9 Parson's Green. It processed children coming into the union's care. Fulham appears not to have run any other children's homes itself. However, the union was a member of the West London School District with some of its children being sent to the District School at Ashford. The building is now part of Lady Margaret School. General records — Guardians' minutes (1845-1930); Committee minutes (1851-1890); Financial records (1845-1930); Staff records (1867-1930). Fulham Palace Road Workhouse — Admissions and discharges (1873-7, 1890-1); Births (1866-1915); Creed registers (1879-1914); etc.